As the flu season is upon us, I want to share our family's terrible experience with the nasal FluMist so that hopefully other children and families can be spared from a similar nightmare. Last year we gave our 4.5 year old son the new nasal FluMist which is being marketed aggressively to young children as a seemingly "safe" alternative to the flu shot. It supposedly does not have Mercury like other flu shots and is very easy to administer as it is simply inhaled, avoiding a painful shot (which could seem to be a good thing with young children). What we did not realize is that it is a very powerful live virus and has some very, very bad preservatives, such as MSG. Worse of all, it contains Polysorbate 80 which breaks through the blood/brain barrier in order to penetrate the brain directly! I am thrilled to say that through a very aggressive bio-medical program (GF/CF, detox, enzymes & supplements, cranial-sacral, LOD and more to come! ), just one year later, he has now almost completely recovered from this awful regression. He is now once again a delightful, fully verbal, fully related, mostly regulated and happy little boy who plays very well with other children and does extremely well in school in a mainstream inclusion environment. It's hard to believe the transformation and we thank God everyday. But really, we count ourselves extremely lucky. And now we are very concerned for other families who might face the same terrible consequences of the FluMist. We feel honor-bound to warn other families of the potential danger and hope that something good for someone else can come from our awful experience. Of course it's a very personal decision for each family, and we respect that. I just want to ask people to consider the decision very carefully, particularly if their child has any sensory issues or developmental delays. 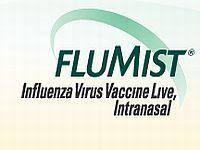 I have heard so many parents say they are so happy that now there is a flu vaccination option that does not contain Mercury, but just beware that there are other very dangerous components to the FluMist! Also, one of the reasons that I decided to give the flu vaccination is precisely because our son had a weak immune system…he seemed to get sick at the drop of a hat. But I did not realize that that logic is faulty and one that causes many parents to make a similar mistake. If a child has a weak immune system, vaccines are even more dangerous as the body cannot deal with them in the proper way. Now I understand that a weak immune system in a child can seriously effect the brain and result in worsening neurological issues, therefore the focus should always be first and foremost, about strengthening the immune system—which does NOT mean bombarding it with a live virus, foreign proteins and a host of dangerous preservatives such as MSG…. I am certainly not an expert. I am learning all this stuff as fast as I can and pretty much flying by the seat of my pants as we go, but please, feel free to contact us anytime if anyone has any questions about our experience. We would be really happy to try to help! *An excitotoxin is a name that is given to one of these neurotransmitter chemicals that comes from outside of the body and has an excitory effect. Over stimulation of the neurons causes them to fire repeatedly and can be damaging to the neuron such that it can die and types of brain damage will occur. Excitotoxins are not foreign, man-made drugs administered to the body but rather natural compounds identical to the brain chemical that are at levels above that normally found in the brain. The most problematic excitotoxins are those that are amino acids, the chemical building blocks of proteins, such as glutamic acid, usually referred to as glutamate (monosodium glutamate or MSG is the commercial preparation used by the food industry), aspartic acid and L-cysteine. All are neurotoxic, but glutamate is the most potent. Did you know you can create short urls with Shortest and get $$$ from every visit to your short links.